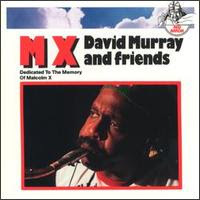 This tribute to Malcolm X is one of the disks that David Murray recorded for Red Baron , the last label founded by Bob Thiele. The group could not be more interesting: the quartet of Murray with John Hicks, Fred Hopkins and Victor Lewis , join the great trumpeter Bobby Bradford and almost debutant Ravi Coltrane . should be surnamed to Coltrane, one of the first session of his career, playing the tenor closely with David Murray and emerge unscathed. The styles of the two saxophonists are quite the opposite, so it works perfectly. The repertoire is based on simple themes and some blues, with the suspicious authoring Thiele hovering above some of them. Anyway, with soloists such as these, the compositions are not important. da, music worthwhile. Murray always a guarantee.